Recently, I participated in a National Shoot to Retrieve Field Trial in Waverly, NE. Normally, my field trialing takes place in Georgia, my home region. 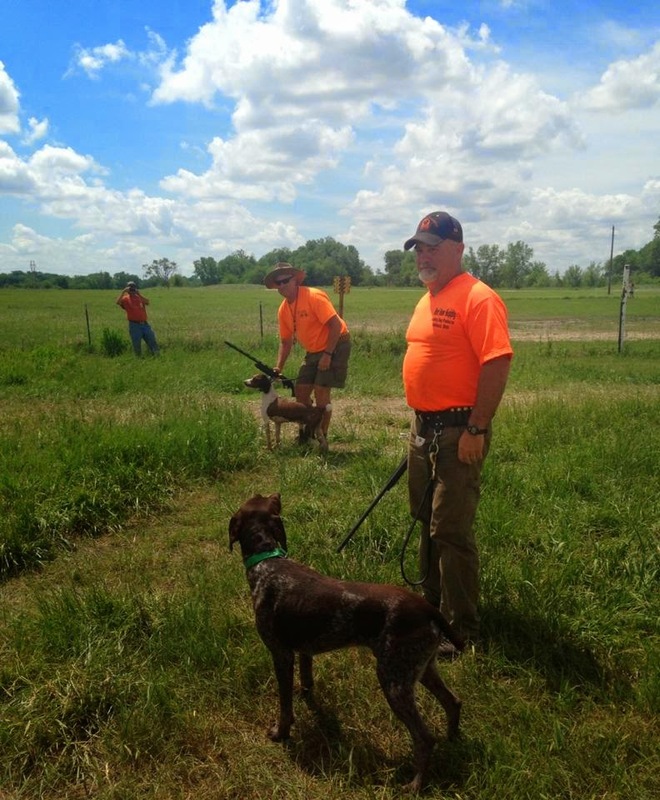 However, since the hunting season was finished and our trial season was complete until September, and my two trial-ready dogs were still primed up, I figured to get one last week of competition on them. 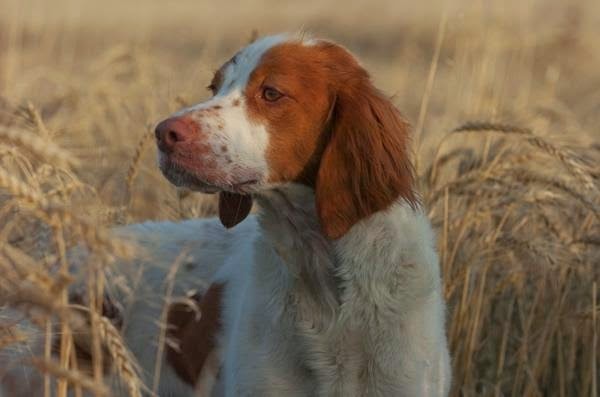 Cap, 4 year old Brittany male, and Ruby, 4 year old Brittany female, were as ready as ever and hardened from 6 months of bird hunting and trialing all over the country. 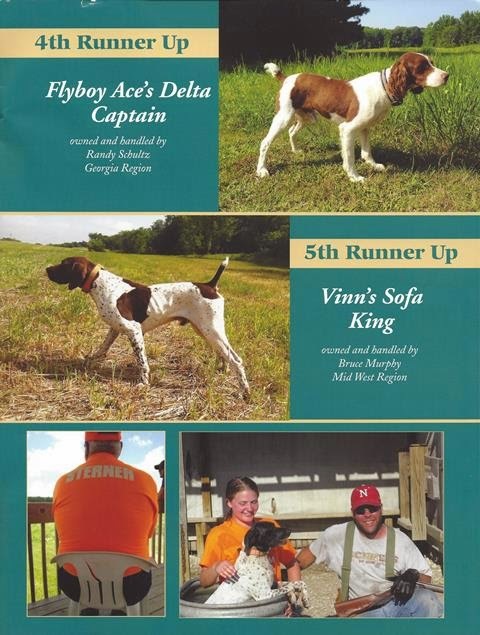 They knew the game and were as solid as any dogs I've ever had the pleasure to own. This particular trial was a bit different, being a "National Trial", one of 5 held throughout the year around the country. The entry field is capped at 128 dogs, many dogs are many time or multi-champions. Ruby and Cap were very close to their championships prior to this trial. The work-ups to the main trial allowed us to run several "normal" trials and possibly pick up points toward a championship and that was a consideration, as well. As it happened, Ruby had two third placements and Cap had a first placement during the elimination rounds. 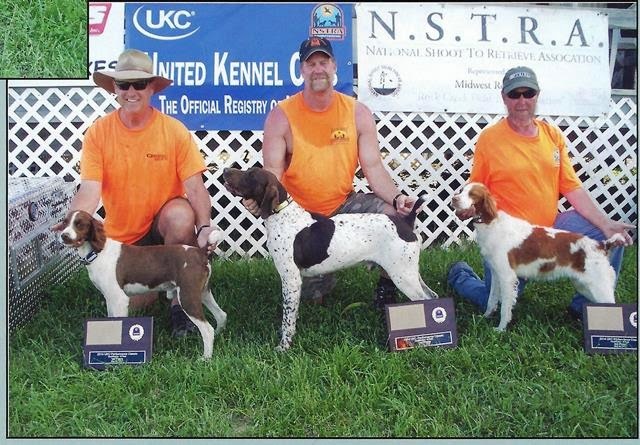 Cap was only shy one first place finish for his championship, so, when he took the field for his Final 8 Brace run, he was a NSTRA Champion. We arrived a week ago, after a leisurely Memorial Weekend drive through the heart of America. Cap and Ruby knew the drill after a season of hunting. We were rested and fit and ready to run. The heat arrived about the same time we did. Highs of 96 on the fields pushed the dogs to the water barrels and ponds more often and the handlers wore shorts and short sleeves and suffered through grass cuts and black flies. Shade was a commodity in short supply, but the clubhouse had a large covered porch that felt like heaven after a brace. After all those days of braces running two dogs and with generally good runs (one I wish I could forget, we were beaten so badly! ), here we were at noon on Saturday a week later. Ruby made the Final 16, but was eliminated earlier that day in a squeaker. I was proud of her. She never quit, never slowed down. Cap made it through the 16, and he I were heading to the line one more time in the Final 8. Cap and I ran this particular field only once the entire week prior. I told him not to worry, birds smelled the same on this field, the next field or 5 states over. He told me "No sweat, Pops! Just shoot 'em when they get up and follow me. I got this thing nailed." Lack of confidence was never a problem in the little guy. The judge said turn them loose, and I let him go. Cap immediately turned left and hit full stride along the edge of the boundary. The edge line cut left again, but he continued straight, into the field, full speed, smoking! I knew there was normally a bird close to the front, a "gallery bird", so I let him run. He made a loop to the left, in the corner, and, still at full stride, headed back to me hard along the edge line. Not 15 seconds in to the brace, he was flying now, coming straight at me as I stepped in to the field, loaded my gun, stowed my lead and watched him. About 20 yards away, maybe 3 yards in the field, headed straight to me, he pitched left, his rear end flew out from under him and he rolled over. He came up and stood tall and still, pointed as proud as I've ever seen any dog! "Point", I yelled (perhaps a little too loud, since I heard the gasps from the gallery. I'm going to say right now pride can be a downfall, but I was downright proud of that little dog right then!). The shot and retrieve were normal and we had a decision to make. Cap looked at me and I motioned to him in a direction that would take us directly across the square to the opposite corner. The wind would be on our right shoulder. Our opponent would be caught in the right corner, as well. Which is where he went off the line. If we could get the bird in the middle or far corner and then come back left for another bird, that would be three birds out of five. We would be sitting pretty good. About halfway across the field, I noticed my opponent executing a retrieve in the corner. It was one to one. As I looked up, Cap spun and locked up, "Point"! He was a long ways away, but staunch and the bird obliged by holding until I arrived. Once again, the shot and retrieve were normal. This time I sent Cap into the large area remaining, in which no dog had been, the last corner. He took off, and I looked for my opponent. He was hurrying across the center of the field for the same corner. Both dogs were moving quickly now and it was really a race in the tall grass. No one knew where the bird was or even if there was a bird there, but we sure did act like it. Cap spun first. "Point", I yelled, this time with some gusto, since I was 50 yards from anyone and standing out on the Nebraska prairie watching my little guy run his heart out. It took me some time to get to him again and, just before I did, I heard a shot and saw my opponent's dog running to a downed bird in the center of the field. My bird flew and dropped for the retrieve. It was three to two. At this time, I pointed Cap at the other handler and we went with him. The reasoning was this: If he finds another bird, I will get a back- I'm still ahead. If I find a bird, he will get a back- I'm still ahead. In a "beat your brace-mate" format, the tactics changed somewhat. We worked along together for a while until my bracemate spun around and made a beeline for the fence separating the two fields. It didn't take a rocket scientist to deduce that he may have held a clue as to the whereabouts of another bird or at least suspected the location of a "crossover" bird from the other field. He was ahead of me, but Cap was fast and got to the fence just about the same time as his dog. Both dogs caught scent now. The grass was easily four feet tall in the little slough and the dogs ran through the grass several times. My opponent went in to the grass and called his dog in to the spot he suspected. Cap was about 30 yards away and I was coming up fast from the center of the field. "Point" he yelled! It was three to three. "Cap! Here, boy!" Cap came up fast to me, looked to his right and spun around in a point. "Back", I yelled! He stuck it! I walked to him, knelt down and took his collar in my hand and told him I was really proud of him today! Our judge walked over slowly, got down on a knee, and looked the situation over. 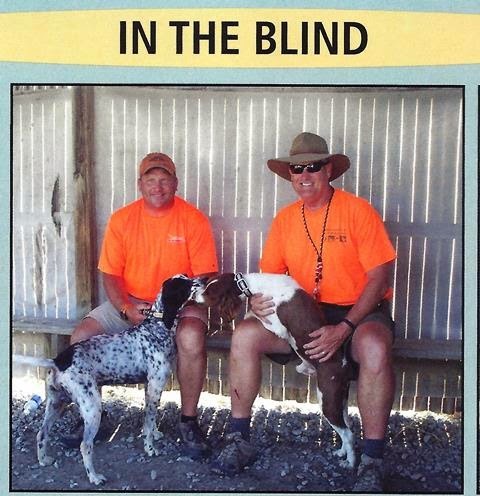 He whispered to me, "Randy, I think Cap is backing the situation (can't really see the other dog, just the other handler) and I'm going to give you another chance at a back." Judges make judgment calls, it's why they aren't called scorekeepers. I said, "Are you sure, Judge?" He nodded, and that was that. We would not get any points for the back. The score was three to three with 5 minutes remaining. We hit every corner, ditch, slough and clump in the next five minutes and when time was called we were at the opposite end of the field. Our judge rolled up and asked if we wanted a ride back to the clubhouse, but Cap and I decided we would just walk back and soak up the day. If this was the end of the run for us, I wanted to take the stroll back nice and easy and enjoy every bit of it. We did a good job. More importantly, my dogs did a good job. We lost by 21 points difference out of over 1200. We gave 'em a good scare! We had a good time and had some laughs, some agonizing moments, some disappointments. Overall, the total experience was worth the travel and training and money. After all, it really was about the people and the dogs....mainly the dogs. 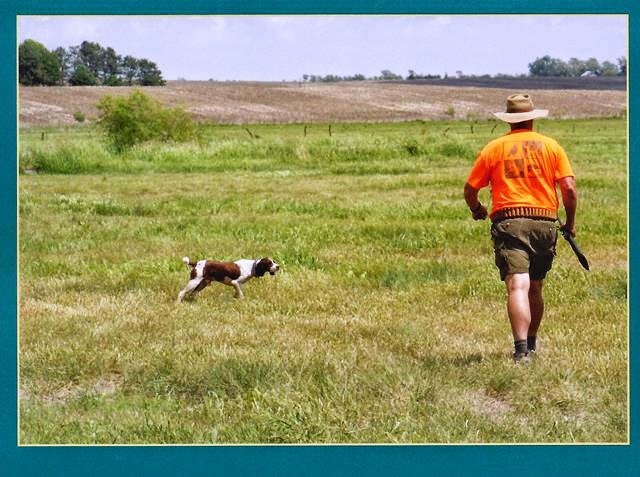 NSTRA is a great way to spend a day in 30 minutes with your dog. Head to the Mountains for a quick break!